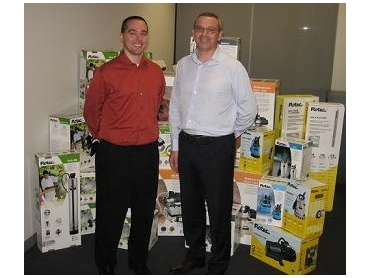 The Selecta division of Silvan Australia has been appointed as exclusive distributor for Australia and New Zealand for the new Flotec range of domestic and agricultural pumps. The Flotec range is manufactured in Pisa, Italy to demanding product quality and performance standards. The company is a member of the international Pentair Water group of companies, which also includes the leading Australian Onga brand. The Flotec range including water transfer pumps, pressure boosting pumps, garden and submersible irrigation pumps as well as the Hydroblaster series of petrol-driven self priming pumps will shortly be released in the market. Selecta’s product manager, Greg Everett says that the Flotec range is certain to find a significant user base in meeting Australia’s water transfer needs. The Flotec range includes the Gardenjet series of five separate mains electric pumps with open flow rates from 45 to 70 litres a minute. The Flotec Multimax range comprises of three stainless steel self-priming electric pumps with a multi-stage hydraulic system complete with dry running and motor overheating protection. Multimax garden irrigation pumps offer flow rates from 85 to 200 litres a minute. The Flotec Ergon is a completely automatic plastic-bodied electric pump with variable speed and constant working pressure, a flow rate of 85 litres a minute as well as an LCD monitor. The Flotec Autojet series consists of two automatic pumps with an electronic controller to start on demand every time that a tap is turned on. The Flotec Hydroblaster is a range of two four-stroke petrol engine-powered pumps with excellent portability and corrosion-resistant glass reinforced plastic pump components. These models can also be used as chemical transfer pumps and offer flow rates of either 200 or 600 litres a minute. Flotec also has a range of electric submersible pumps specially designed for water transfer from a well, bore or other immersion situations. They are designed to be left permanently in place at a maximum depth of up to 20 metres of water. The models designed for deeper immersion feature a stainless steel motor shaft and pump body while the base model suitable for immersion up to nine metres has a multi-stage hydraulic system and float switch. The Flotec Waterpress pressurised or booster pumps are designed to give an adequate pressure supply for a house or garden at flow rates from 45 to 70 litres a minute. Other pumps in the Flotec range include clear water drainage submersible pumps and wastewater pumps to suit sewage, flood water or similar drainage needs.